This server has received 2229146 hits from both ipv4 and ipv6. Some of our customers may have received an email from abuse@imperialregistrations.com with a download link to an external website along with an USA telephone contact number. Please be advised that this is a phishing attempt and not sent or authorized by 2020Media. 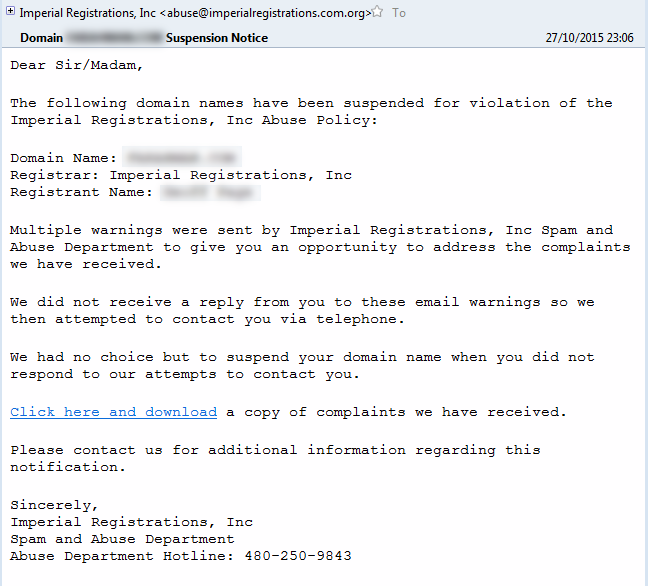 We have also discovered that a number of domain name registrars have also been affected by this. These emails are being sent to the registrant email address fetched via the whois record associated with the Domain. We advise you to delete the email immediately. Here is a sample of what the fraudulent messages look like.